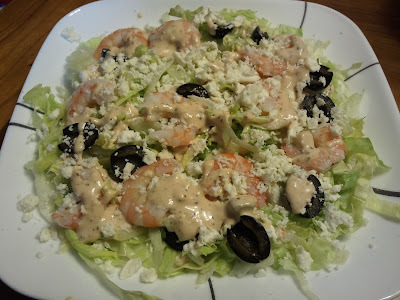 When I was little I got to help make the Shrimp Remoulade Salads for Thanksgiving Dinner at my friend Marianna's house. The only addition to this salad is the feta cheese. You MUST make the Remoulade Sauce. It's the star of this show. Follow my links for the recipes for boiled shrimp and the Remoulade Sauce. Traditional Shrimp Remoulade is served with iceberg lettuce. I recommend boiling the shrimp and making the Remoulade Sauce the day before and refrigerating them overnight. Peel the shrimp when you are ready to make the salads.